With its location near the equator and on the Pacific Ring of Fire, The Philippines is one of the world’s most disaster-prone countries, with an average of 20 typhoons per year, as well as earthquakes, landslides and volcanic eruptions. In the southern Philippines, long-standing conflicts between religious and ethnic groups challenge lasting peace and development. Catholic Relief Services' humanitarian work in the Philippines answers the call for immediate help after disasters. CRS commits to help those affected by emergencies recover with living supplies, shelter and jobs. We also help build peace and resilience in areas affected by tension. But this work cannot be done without you. When you donate to CRS, you do it all. You teach families to put their lives back together after disaster. You rebuild better homes and stronger futures. You bring dignity to communities and families affected by conflict. CRS’ humanitarian work in the Philippines focuses on five primary areas: responding to emergencies and teaching resilience, preparing communities for disasters before they happen, constructing innovative and safe shelters, agro-enterprise development, and peacebuilding. To date, the largest example of CRS’ emergency response and recovery efforts followed Typhoon Haiyan. Considered one of the most powerful storms to ever make landfall, Haiyan slammed the center of the Philippines in November 2013. The storm left more than 6,000 dead and 14 million people affected. Within three months of the typhoon, CRS, in collaboration with Caritas, was able to provide 40,000 families or 200,000 people with emergency shelter, clean water and sanitation. This was accomplished because of your support. But CRS and you have not left the Philippines after Haiyan. The work continues as families find sustainable jobs and innovative permanent housing. CRS rebuilt and repaired more than 20,000 houses by December 2015 as part of one of the largest rebuilding projects in the country. With your help, CRS has also committed to a resettlement project for Haiyan-affected families still living in vulnerable communities. The project will help relocate them to a more resilient, safer community. By supporting CRS, you are also helping bring aid and peace to communities in the southern Philippines. You are there as CRS helps vulnerable people caught between a violent present and their hope for the moment they can begin to plan for their futures again. In 2013, Typhoon Haiyan was one of the most powerful storms ever to make landfall. In the Philippines, it washed away the Anibong community. People rebuilt after the storm, but the area remains dangerous—it floods, there’s no running water, toilets, etc. It's been declared a no-dwell zone. Girlita “Girli” Ascalona and her family are among those forced to leave their homes in Anibong. For many poor and vulnerable Filipinos, owning a home is out of reach. Even with her husband having a steady job in sales, Girli couldn't afford to buy a house. 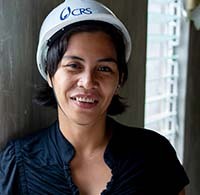 So CRS is taking on a major project in the Philippines. We're building a new community for 900 families being evicted from areas in Anibong. Click to learn more. The Philippines is prone to natural disasters. Six to nine typhoons make landfall each year. That’s why it’s crucial to help people living in the most vulnerable conditions become more resilient to natural disasters. CRS is helping families prepare for natural disasters and reduce the storm impact. We show communities how to prevent flooding with trash-collection businesses, while earning an income. 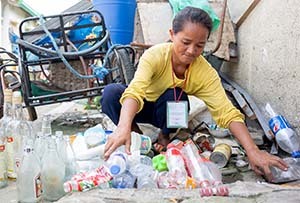 See how Marissa Cabalan is not only keeping her neighborhood clean, but is providing income for her family. CRS also creates safe evacuation centers where families can relocate, helping them decide what paperwork to take during an evacuation and creating community savings and lending groups to save money. 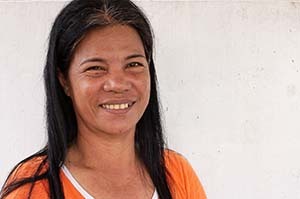 Remy Demingoy was able to make home improvements to help storm-proof her home.See how she and others are using community savings and lending groups to build a business selling coconut water and using her profit to make her home safer during Typhoon season. A CRS workshop helped a young man put down his gun and pick up a pen—and a new life. A haven for young mothers represents a practical outcome of CRS peacebuilding. CRS is providing emergency relief in the aftermath of the storm. The immediate focus is on rescue efforts and immediate aid, but CRS is prepared to help families fully recover. Since 1945, CRS has been supporting the Philippines and providing Filipino communities long-term development aid through various programs ranging from emergency response and recovery to disaster preparedness, agro-enterprise and peacebuilding. CRS helps communities and families to more effectively protect their lives and livelihoods and mitigate the effects of disasters through disaster risk reduction. In emergency response and recovery efforts, CRS takes a comprehensive approach that addresses urgent life-saving assistance with an eye toward a full recovery. The agency also aims to help people survive with dignity, get back on their feet, rebuild their homes and lives and strengthen their long-term stability and resilience.